I made this yesterday for the Boy Scout dinner we had. I use a basic dinner roll dough and roll it out into a large rectangle. I use a pizza cutter to cut the strips on the side. Then I put a cream cheese mix with 8 ounces cream cheese, vanilla extract and a bit of honey down the middle and top it with a jar of fruit preserves (here is the apricot/pineapple preserves from Walmart but I also use peach or strawberry and even blueberry sometimes.) After it is spread I start braiding and tuck in the ends. I let it rise for about 15 minutes and then bake in a 350 degree oven for about 30 to 40 minutes or until completely done and golden on top. I drizzle a powdered sugar, water and vanilla extract glaze over the top and cut into strips to serve. Makes a great dessert or breakfast for a crowd. Wonderful idea! I've done the same thing with pizza fixings - cream cheese, pepperoni, mozzarella cheese and Italian seasonings spread down the middle (before the cutting and braiding). I use marinara sauce (heated) to dip in once the whole thing is finished baking. I also do an egg wash before baking. YUM!! I'll have to try it with the "sweet" innards too! Thanks Janet!!! It is great to hear from you... I am going to have to try your pizza pocket idea, too. 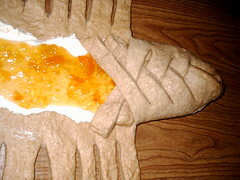 I have done a stromboli that is similar but without the marinara sauce and cream cheese. Sounds scrumptious!!! this looks UTTERLY AMAZING AND DELICIOUS! This is great... I had already seen your first post about the braided bread and was just coming back to ask you to explain more closely how you achieved the braid AND how much filling you used. How serendipitous that you anticipated my questions. Thanks for posting this! I made buns using your braided technique. Very cool!